We’ve been installing and replacing fascias, soffits and barge boards in Nottingham since we started our company in 2001. We’ve got great expertise in the field, so you can rely on us to deliver a quality customer-focused service. Call for a free quote on 0115 815 7004. Working in tandem with your fascias, soffits and bargeboards, your guttering moves water away from the roofline and safely into drains. Damaged guttering is often the cause of that incessant dripping that occurs when it’s raining, which can lead to a host of resulting problems, including damaged brickwork. Call us and we’ll tackle the problem. Similarly, if your waste or downpipes are blocked or damaged then there could be trouble ahead. 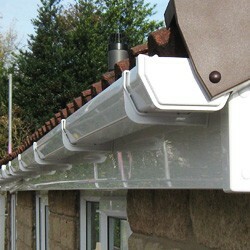 Dealing with a guttering problem as soon as it occurs is the best way of eliminating future problems. What are fascias, soffits and barge boards? Fascias, soffits and bargeboards allow your home to “breathe” while performing the all-important task of keeping the weather out. Speak to us if you think you may need to replace yours. Get in touch for your personalised free estimate from us today!